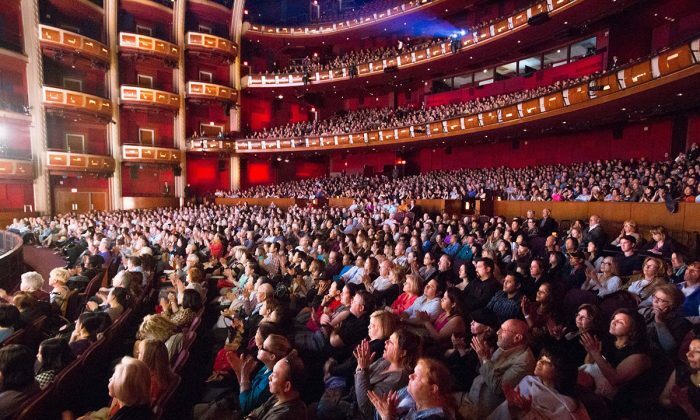 LOS ANGELES—Shen Yun Performing Arts, the New York-based non-profit, once again brings the beauty and wonder of classical Chinese dance and music to the Greater Los Angeles area. Starting March 19 and running through April 30, Shen Yun continues its 2016 World Tour with 31 performances in 8 venues throughout Southern California. In previous years, all the performances have completely sold out. “Breathtaking,” “emotional,” “powerful,” “graceful,” “energetic,” and “courageous”—these are the words that have been used to describe Shen Yun’s universal allure. Shen Yun is experienced through the heart and soul by audiences around the world. When Ariel Kim first received a Shen Yun brochure she felt that a Buddha or Bodhisattva Guanyin had called her to go to the Kennedy Center Opera House in Washington, D.C., on Feb.20, 2015. “When the curtains went up, I could feel the energy slowly coming off the stage and slowly coming into my being, into my heart, and my mind and my soul. I could feel the power. The dancers were just spectacular. The energy that comes off those people was amazing. That energy will bring transformation to all of its audiences,” Ms. Kim said. His Eminence Cardinal Donald Wuerl also took in the evening performance at the Kennedy Center Opera House in Washington, D.C.
Ms. Gail Pauly experienced Shen Yun at the Lincoln Center’s David H. Koch Theatre on March 12. June Singleton and her sister Mavis Gardiner received a unique and special gift: tickets to see Shen Yun at the Lyric Theatre in Brisbane on Feb. 27. “It was beautiful. It lifted us out of the violence in the world now. It just brought beautiful things and peace and happiness. And all the performers, they were so happy and perfect,” Ms. Singleton said. Shen Yun’s story began in 2006. It was born from a wish to restore the true, divinely inspired culture of China and share it with the world through the universal language of the performing arts. This wish immediately drew top artists from around the world, all with a passion for the classical arts. They immersed themselves in Shen Yun’s mission to revive a culture that was once almost lost. Today Shen Yun regularly traverses five continents, visits more than 100 cities, and performs on the most prestigious stages reaching countless numbers of people each year with a new show. All so they may experience and receive the ancient Chinese gift to humanity—integrity, kindness, and forgiveness. Shen Yun is not just any performance, it is an experience that goes deeply into the heart and soul of the audience. For tickets in the Los Angeles area, visit http://www.shenyun.com/LA.